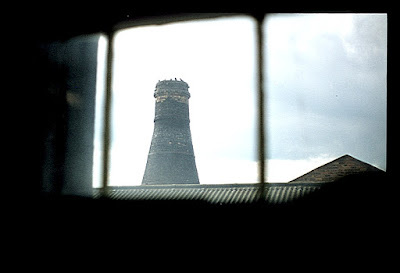 The oven at the factory site of Hudson and Middleton (Longton) Ltd., was chosen for the Last Bottle Oven Firing for a number of reasons. It was in working order. When the Fireman, Alfred Clough, was asked "can it be fired?" he paused. Then he declared "Yes ... Once!" It was close to the Gladstone Pottery Museum - about 250 yards away. Communications would be easy. It was an updraught bottle oven and therefore relatively easy to fire. The Sutherland Works is a Grade 2 Listed Building. The bottle oven used in the Last bottle Oven Firing is known as an Updraught Stack or Cone Oven. More about oven types here> . This type of oven has its chimney stack built directly onto the shoulders of the crown of the oven. It has no separate hovel. For this reason it is also known as 'close coupled'. This is the form developed when a series or row of ovens are grouped together under one roof, the stacks rising through the roof of the building. These ovens are solid and compact but they tended to be more difficult to repair and took longer to cool down. The oven used for the Last Bottle Oven Firing 1978 had the chimney stack built onto the shoulders of the crown of the oven and it protruded through the roof of the surrounding workshops. Bottle oven - updraught stack or cone oven. Cross section diagram. 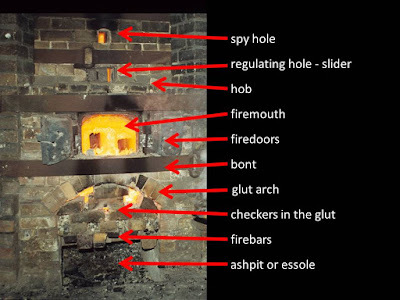 In comparison, the diagram below shows the layout of an Updraught Hovel Oven. It is the type of oven you can see and explore today at Gladstone Pottery Museum in Longton, Stoke-on-Trent. The diagram shows that the oven itself is separate from its stack. Bottle oven - UPDRAUGHT HOVEL OVEN. 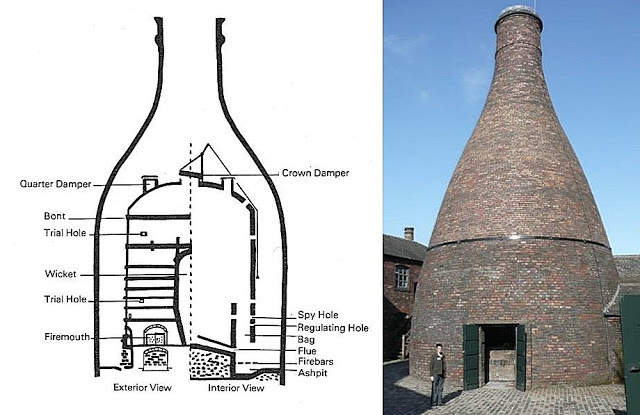 Cross section diagram and external view of an oven at Gladstone Pottery Museum, Longton. The two ovens were operated in essentially the same way. Use - the oven was originally used for firing china biscuit. For the Last Bottle Oven Firing it was used to fire glost pottery so that finished pottery could be seen and sold. The image below shows the various parts of one of the eight firemouths in the bottle oven used at the last firing.